Last May I had the privilege of (very briefly) meeting Edward Lee, Chef/Owner of 610 Magnolia at the Le Creuset and Garden & Gun Chef’s Roundtable. 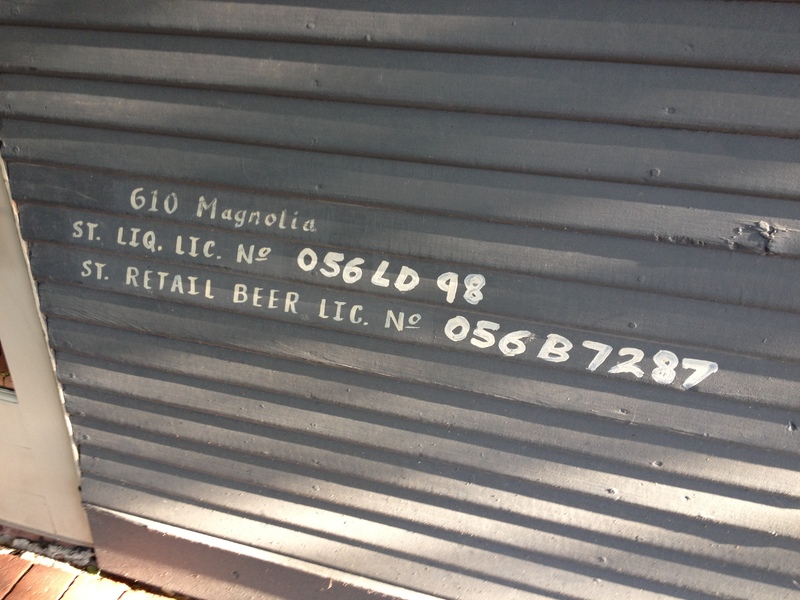 When we decided that Louisville would be our anniversary destination, I knew we had to eat at 610 Magnolia. We made reservations way in advance and called when we got to Louisville to see if we could come early for a drink or two before dinner. When we arrived, they literally had two seats at the bar, moved there just for us. 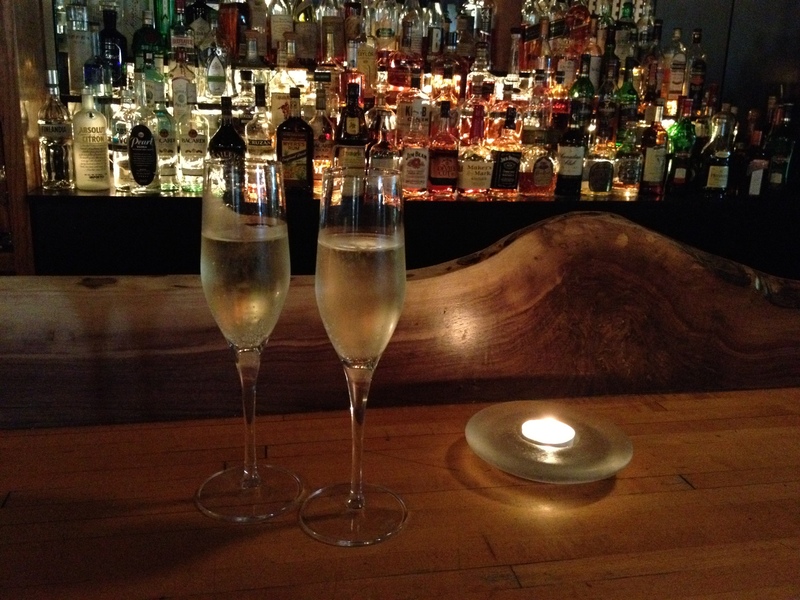 We also received a complimentary glass of champagne to start off our night! We eagerly sat for dinner, dying to see the menu, and were so excited to see some of our favorite dishes on the prix fixe menu. 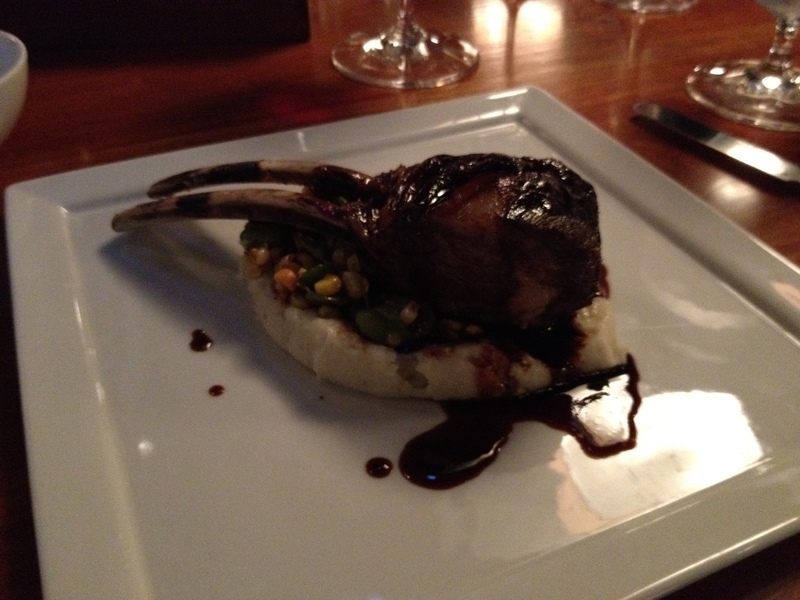 These included short ribs, tuna and of course chocolate! 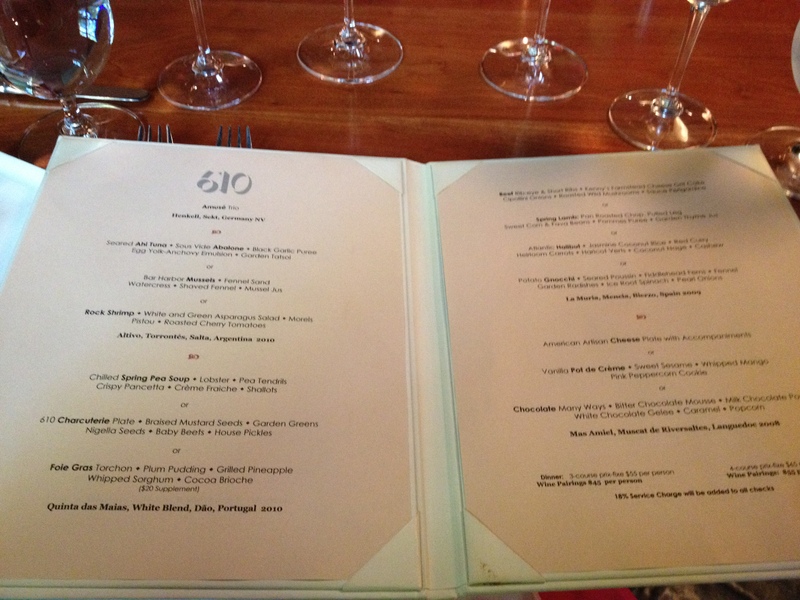 We also were surprised to see that the cost was only $55 for the 4 course meal and $65 for the 5 course meal. 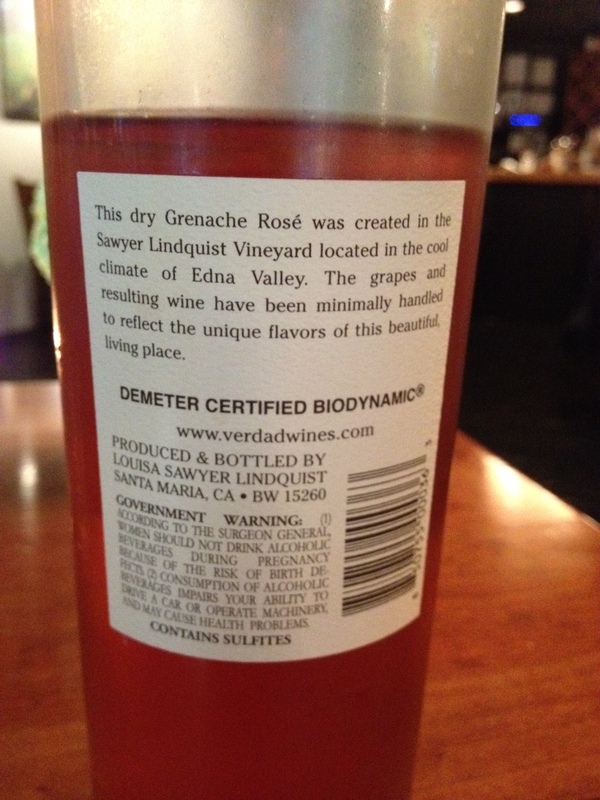 We also each got the wine pairings with our meal, which was definitely a must for me. Here’s a snapshot of the trio. The last item was the Chef’s take on a BLT and contained a BLT pâté in between two crispy pieces of bread, definitely one of our favorites! 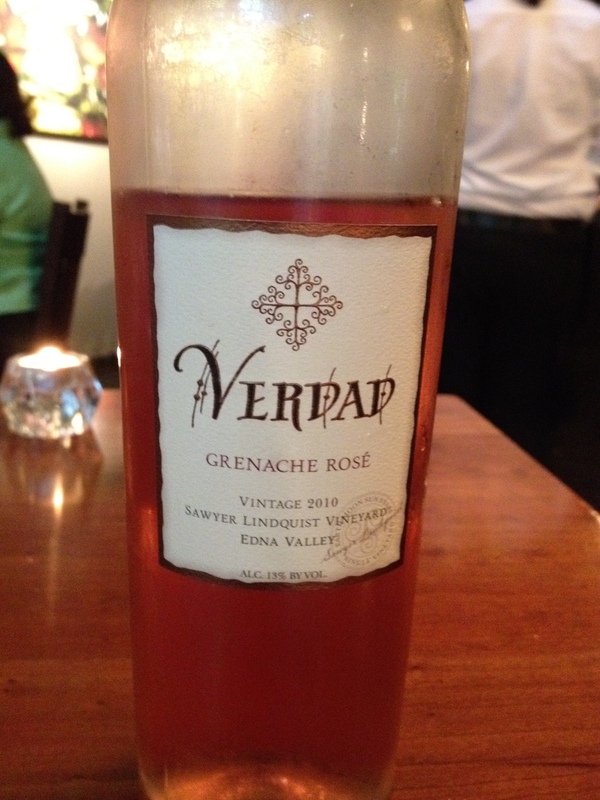 I had already had a glass of the wine that they were intending to bring with our first course, so the Restaurant Manager/Wine Director brought out what I can now call one of my favorite wines ever, Verdad. At first sniff, it reminded me of cake batter, but it was in no way too sweet. Our first course was absolutely wonderful. 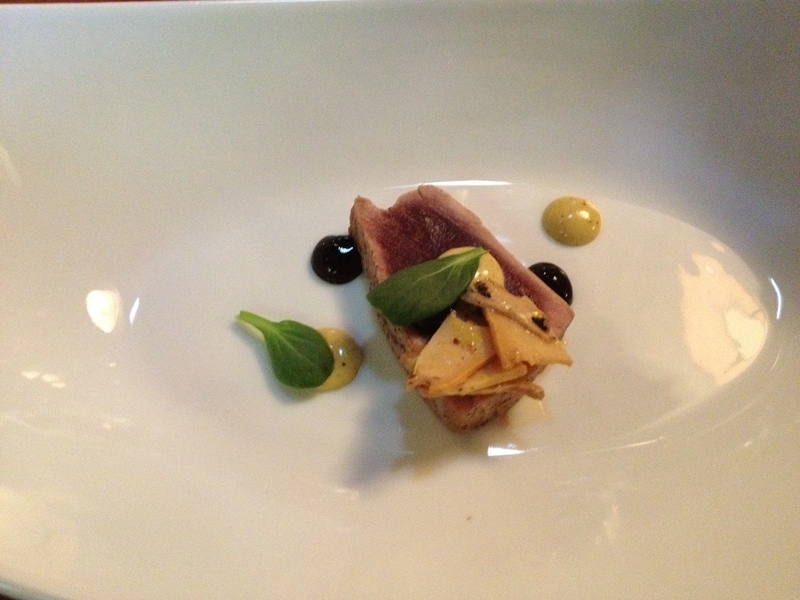 I ordered (my favorite thing ever) Seared Ahi Tuna which came with Sous Vide Abalone with Black Garlic Puree Egg Yolk-Anchovy Emulsion with Garden Tatsoi. I absolutely love his style of blending his Korean heritage with southern cooking. 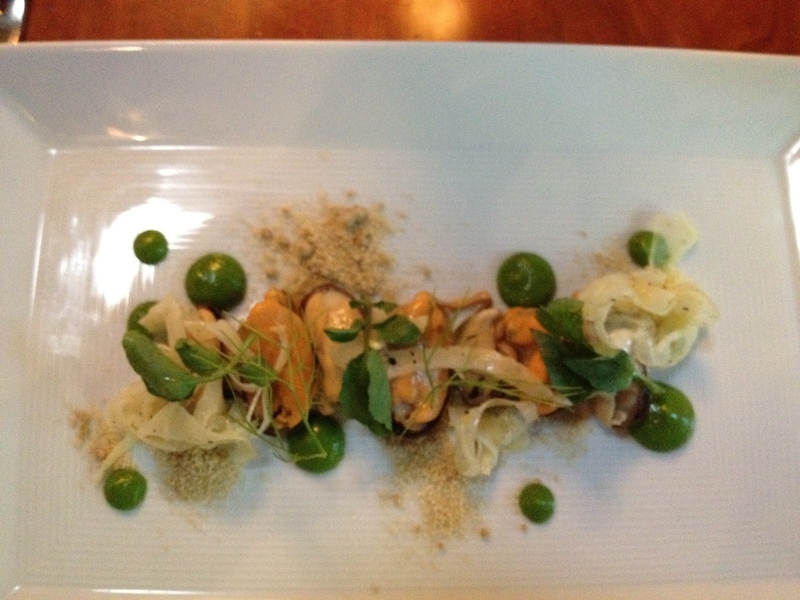 Ryan ordered the Mussels which was equally as fabulous as the Tuna. 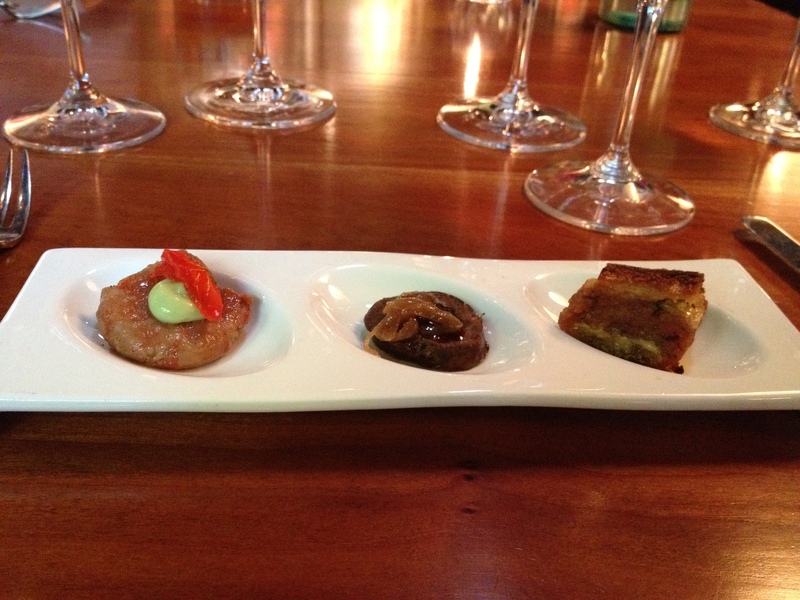 I loved the presentations of these dishes too! 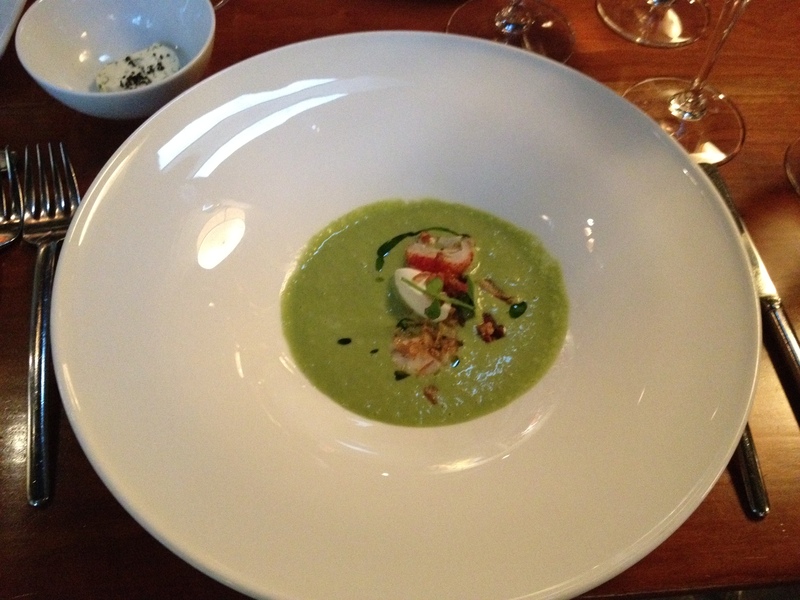 We next moved on to our soup/salad course where I ordered the Chilled Spring Pea Soup with Lobster, Pea Tendrils, Crispy Pancetta with Crème Fraiche and Shallots. Ryan ordered (naturally) the 610 Charcuturie Plate that contained Braised Mustard Seeds with Garden Greens, Nigella Seeds with Baby Beets and House Pickles. 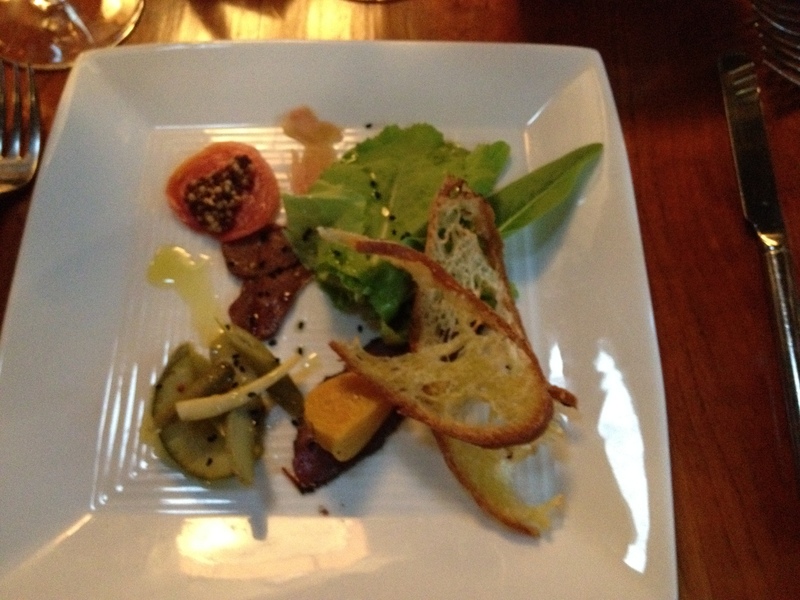 There was also different meats and Blue Dog Bakery bread that was fantastic! And then on to the entrées! We were both overwhelmed with how much food we got with these courses, I couldn’t even begin to finish my meal. Then again, I was really looking forward to my dessert. 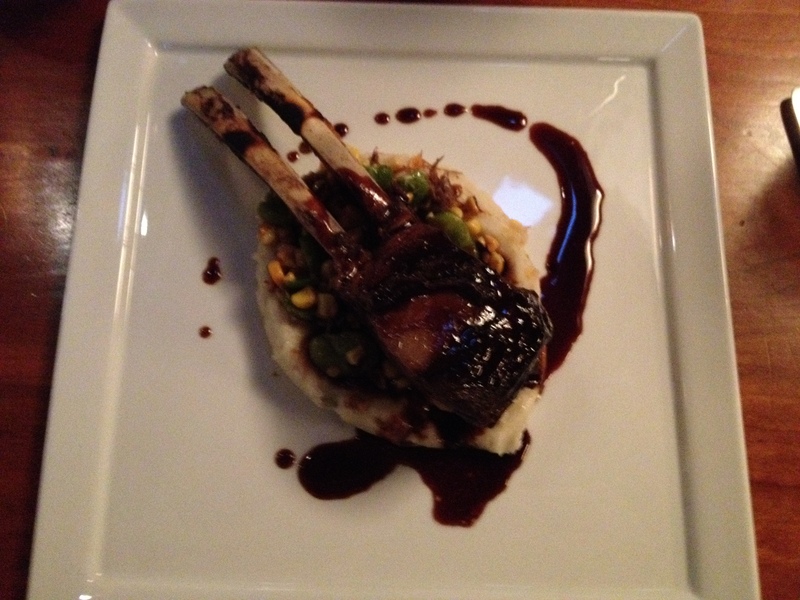 I chose the Lamb entree and it definitely did not disappoint! 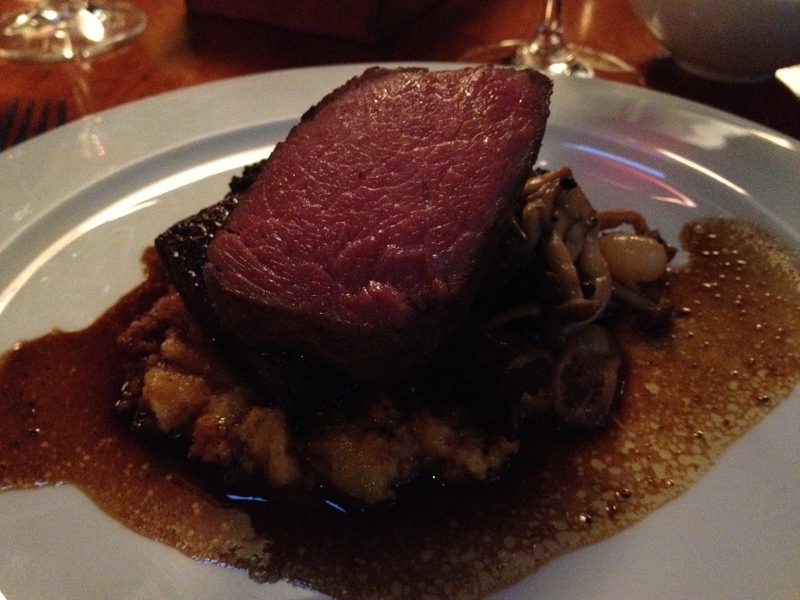 Ryan had the Braised Beef Tederloin and Short Rib, so yummy! 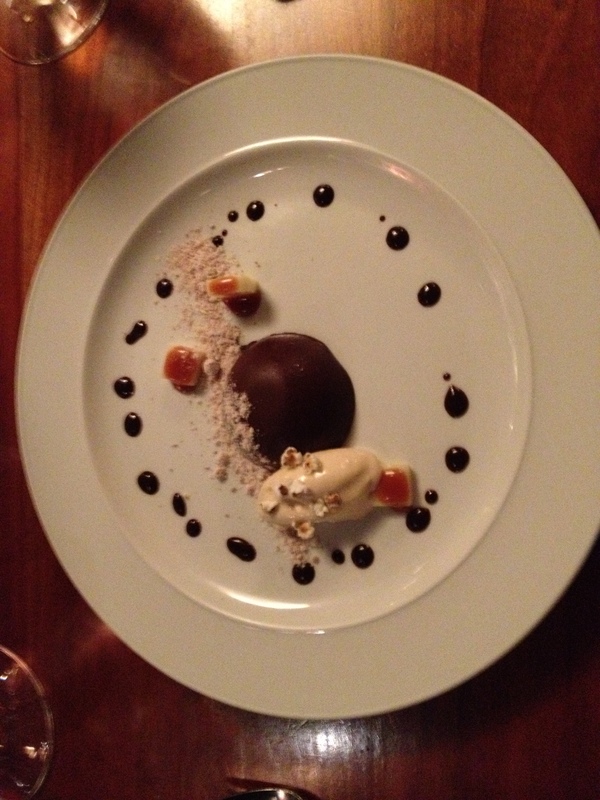 And finally on to the course that I always look the most forward to, dessert! 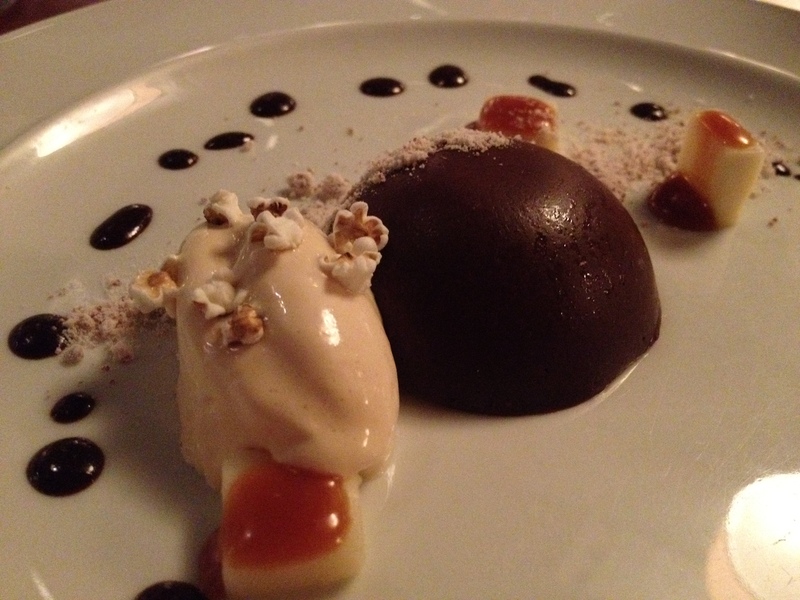 It was a very easy decision for me to order the Chocolate Many Ways that had Bitter Chocolate Mouse with Milk Chocolate Powder, White Chocolate Gelee with Caramel Popcorn Ice Cream. The Bitter Chocolate Mousse was so dense and delicious, almost like fudge. The Caramel Popcorn Ice Cream was the perfect reprieve from the rich chocolate and even had bits of popcorn that gave you the texture you look for in those flavors. Amazing! 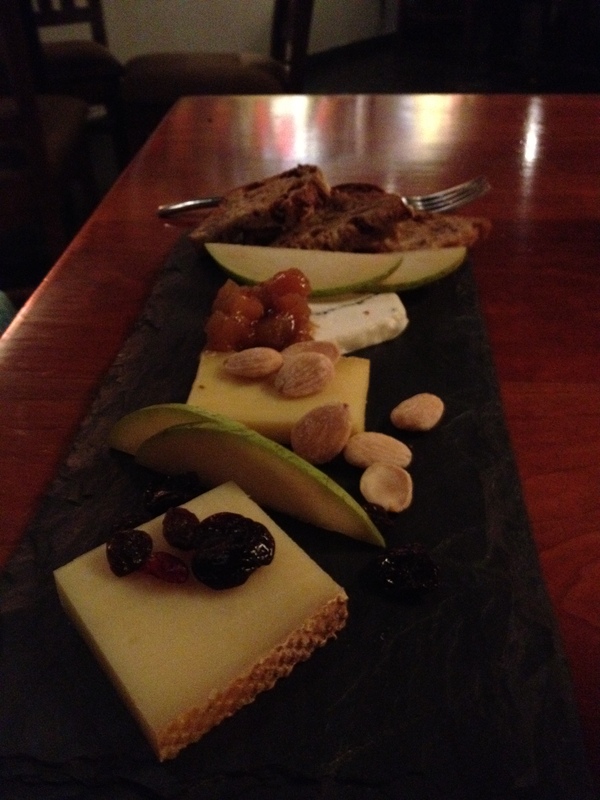 Ryan ordered the American Artisan Cheese Plate with Accompaniments. 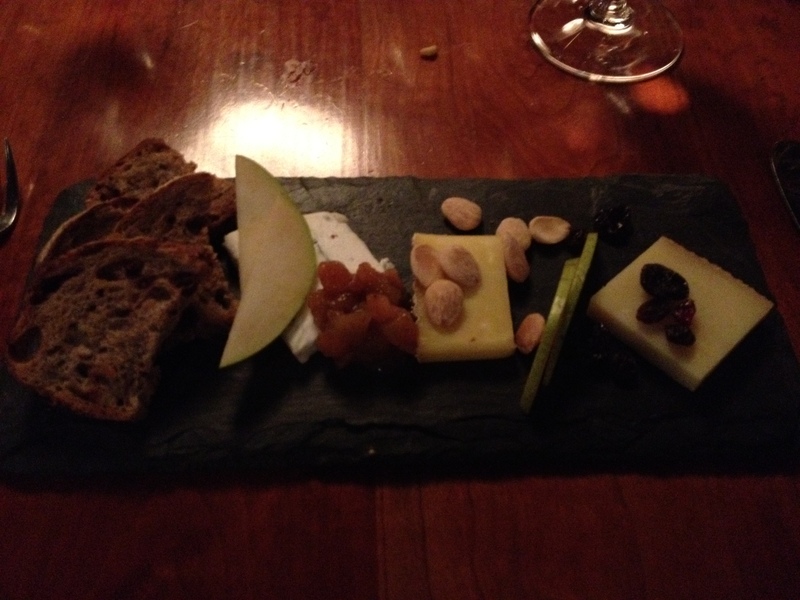 I love a good cheese plate. I feel like that’s one area that Greenville is lacking, its one of my favorite things to order, such an educational and taste journey every time. 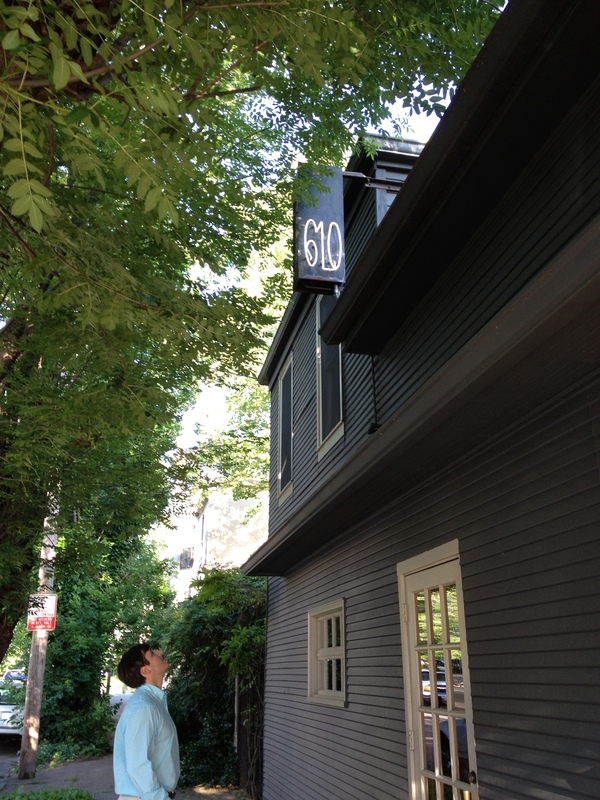 610 was a great experience and felt like such an intimate, hole in the wall celebration for our long weekend. 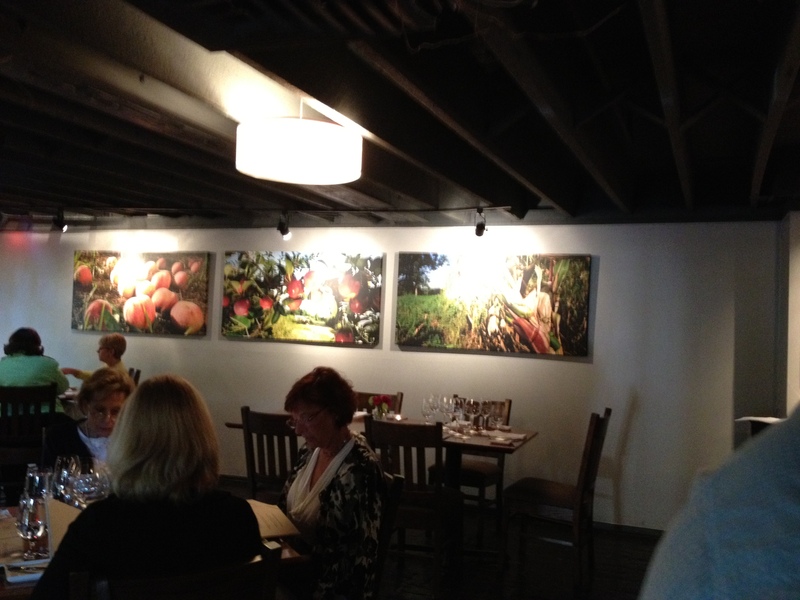 Not to mention, the staff was great, the wine pairings perfect and as you can see above, the food was delicious as well. 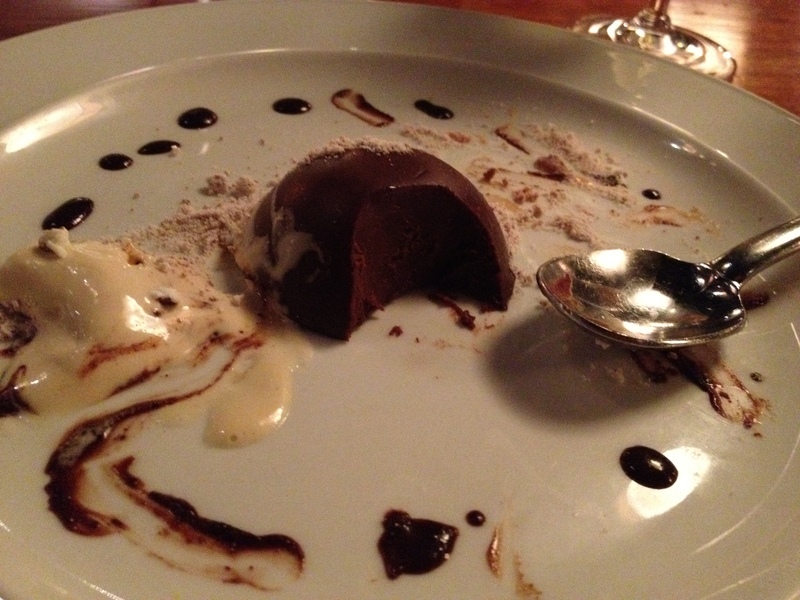 The final delivery to our table was Bourbon Chocolate Truffles, the perfect night cap!